Yesterday at the press conference of Square Enix, a new trailer was revealed of Kingdom Hearts III. Like the Frozen trailer, this trailer also starts with the Frozen world. However also new footage from the previously released Toy Story, Hercules and Tangled worlds is shown. During Sony's PlayStation E3 press conference 2018 another trailer has been revealed of Kingdom Hearts III. This time Sora, Donald and Goofy are revisiting the Pirates of the Caribian world. Also footage from other world is shown. Square Enix has also revealed that the game will get a deluxe edition and a bundle edition. The deluxe edition contains an exclusive steelbook packaging, Mini art book with concept artwork by Tetsuya Nomura and a Collectible Kingdom Hearts III pin. It will be priced at $ 79.99 USD / € 89.99 EUR. 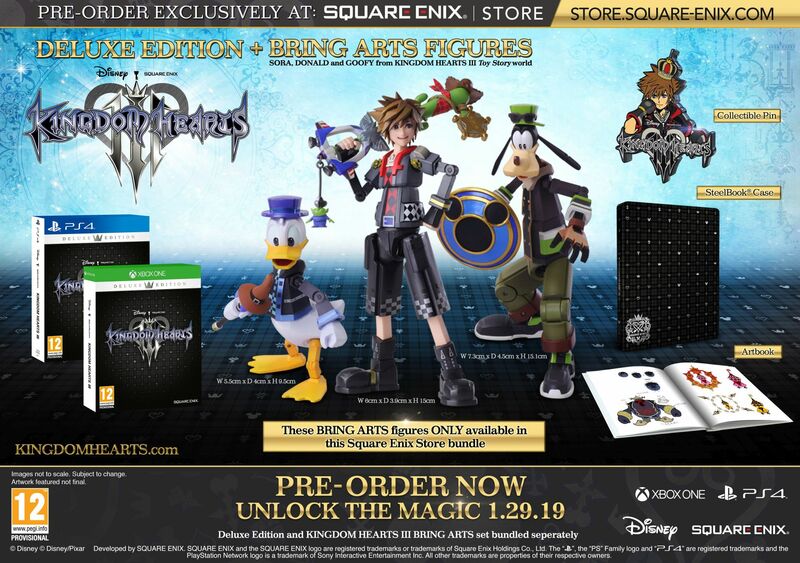 The bundle edition is the deluxe edition plus three Bring Arts figurines of Sora, Donald and Goofy. It will be available exclusively at the Square Enix Store in limited numbers and will be priced at $ 229.99 USD / € 229.99 EUR. 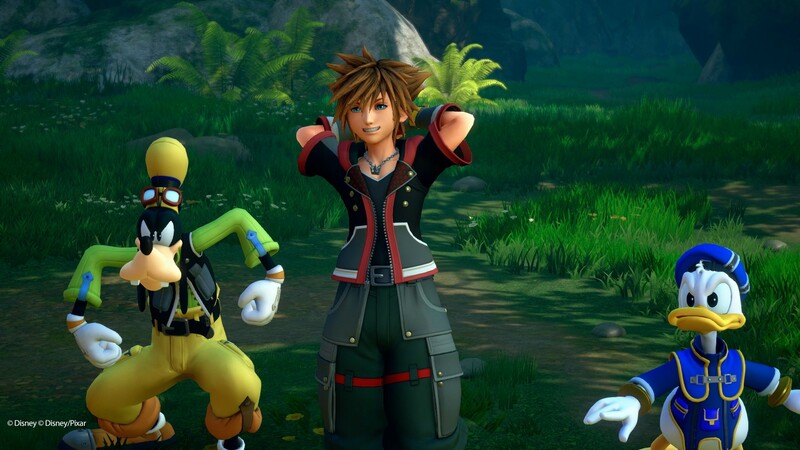 At the Xbox E3 press conference that just has ended Square Enix has revealed a new trailer for Kingdom Hearts III featuring a new world: Frozen. Kingdom Hearts III will be released on 25 January 2019 in Japan and 29 January 2019 in North America and Europe for PlayStation 4 and Xbox One. At last, the release date for Kingdom Hearts III has been announced! The long-awaited action-roleplaying game will be available in North America and Europe on 29 January 2019 for PlayStation 4 and Xbox One. Japan will get the game 4 days ahead of us, on 25 January 2019. During the Kingdom Hearts Orchestra - World Tour - in Los Angeles last night, director Tetsuya Nomura took the stage and made the announcement and apologized that they need some more time than initially planned. No reason for the delay was given. Tomorrow Square Enix will give a E3 press conference where more information and a new trailer will be revealed.